There are lots of things that can hurt a marriage; financial problems, infidelity, differences in religion, differences in parenting, differences of opinion. In our house one of the biggest marital strains is another woman; a woman who comes into our home every night at ten o’clock. Her name is Nancy Grace. Nancy Grace has a “true crime show” on CNN / Headline News. My wife loves the Nancy Grace show and watches her most every night. 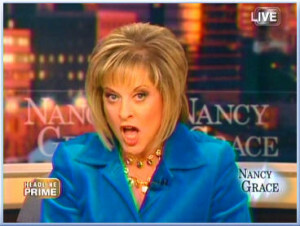 I feel physically ill whenever I see Nancy Grace. I have a similar reaction to Sarah Jessica Parker and Hillary Clinton. There’s something about the look, sound, and mannerisms of these women that makes me twitch. Nancy Grace loves the gory details of crimes; she seems to revel in them, even though she’ll act indignant and shocked as she repeats them over and over again. I flipped out one night last summer as she was reviewing the details of the Caylee Anthony murder case. She must have asked the question, “Is there soft tissue on the duct tape? Is there soft tissue on the duct tape?” fifty times, in that sharp Southern twang of hers. Doesn’t she realize that “soft tissue” she keeps harping about were once the lips of a little girl? Can’t she just chill out about it? “Didn’t she badger a guest into killing herself?” I ask. “Nancy Grace is a (expletive)!” I shout, pointing out how she portrayed the Duke Lacrosse players as rapists for weeks on her show (they were later cleared of all charges) and the way she callously prodded kidnapping victim Elizabeth Smart for details of her harrowing encounter. It gets pretty ugly sometimes. I know that my wife is probably right; both about Nancy Grace being a champion for victims rights and about me being a (expletive). Even though Nancy Grace likes to glorify the gory details of tragedy maybe she has an overall positive effect on society by shining a spotlight on heinous crimes and keeping it there. It’s her delivery that rubs me the wrong way. It’s funny, when I hear Howard Stern or Larry David yelling and screaming about something it usually makes me laugh. But when I hear Nancy Grace (and Hillary Clinton) ranting it gives me a headache. To me, all four people are part of the entertainment industry. It’s when you start thinking of these people as something other than performers that you run into problems, like considering Nancy Grace a reliable news source, or thinking that Hillary Clinton is actually representing your interests in government. Sometimes you have to work to keep a marriage happy. Other times you just have to laugh it off.